Happy 2nd Anniversary to The Greeting Farm! YAY! If you just stumbled across my blog today, be sure to check out TGF Blog to do that whole hop since there are PRIZES to be won! I've been a fan of The Greeting Farm since the beginning! Since before it was The Greeting Farm even! The company was called Pink Poison and there were a couple sets and only THREE Anyas back then. Can you even believe that? It's been amazing to watch the company grow! Marie is one SMART cookie and TGF has just taken off and expanded so much! I'm so happy for her! She's an AMAZING person! Ok, here's my card. I used THIS sketch from Jen Del Muro for this card. This card is made with Mermaid Anya. I think she might be my favorite Anya. I used THIS tutorial from Randi Wall for her hair. The patterned paper is PTI and the bling is from Michael's. I won't take up any more of your time! Thanks for stopping by today! She is just gorgeous!!! You did an awesome job with her hair... and I love the colors you chose! G O R G E O U S ! WOW! This is just one AWESOME and amAZING card. I just love the colors(this is my favorite favorite color in any shade) and your coloring is just fabulous. Thanks for this super duper inspiring eye candy. She is darling. I love the purple!! So cute! Love the monochromatics! Very Cute. I just love the purple! Purple....my fave color. Great card. Gorgeous! Loving all the purple and that hair is Awesome! I'm with you Ashley! I discovered TGF when it was PP too! And mermaid Anya was my first purchase too! :) She's soooo cute! Oh she's so sweet! I love the color scheme you chose, very very cute! I love Mermaid Anya in all purple!!! You did a great job on this love your coloring too!!! Glad that you are participating in the hop with us tonight!!!! I think Mermaid will always be one of my favorites!!! So cute, love those purples! Gorgeous coloring and I love all the purple. Mermaid Anya is my favorite too, I think she always will be! Beautiful card. Awwwww - tooo flippin cute. Love all the purple. This is gorgeous!! Absoulutely love all that purple!! Adorable card. Love the purple. Fabulous card Ashley, love the gorgeous colouring she looks marvelous in purple!!! Absolutely adorable. Love the purple. scrummie card, love the purple hues. So gorgeou lovn all the purple! love the use of purple on your card. Awww, she is one of my all time fave Anya's!! So glad to see your beautiful card on the hop!! Such a lovely card! Fabulous mix of purple patterns! Your hair coloring looks awesome! this is stunning!!! i absolutely adore mermaid anya and what are you talking about?! your purple hair rocks!! Awww! She is adorable Ashley! I love the colors of your card, and it's so nice to see the original Anyas on a card. Wonderful job my friend! Awww, love the pattern plays here in the shades of purple, very mermaid-y. Beautiful card, Ashley. 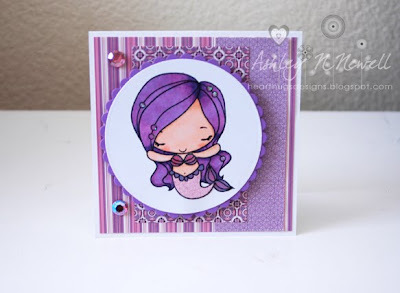 Cute card ~ Mermaid Anya looks great in purple. You are so awesome with your colouring.. love it babe!! Hehehe, when I first saw your card, I thought "wow, that hair looks like Randi's!" LOL! Great job! Love the purple! She is absolutely adorable! Love the purple! this is so pretty! i love all the purples and lavender. way to go Ashley! What a fantastic card!!!! Thanks for the inspiration! I love purple! I would have never thought to use it on the mermaid Anya. She was one of my first Anyas to purchase so I love new ideas for using her. Thanks for the inspiration! I love the colours you've used. Stunning card! I just love Purple.. its my favourite colour.. thank you for doing justice to such a cutie. She looks stunning in purple. How sweet - purple is my personal fav color. Lovely card! I'm a purple fan and this is fab! I love the colours. Purple is one of my favs. Oh I really love this purple cutie! Just Gorgeous...Loe her Purple hair!! Aww she is adoreable. Beautiful colours. Oh this is just adorable. Such a sweet mermaid. Great card! Love the image and the colors! Great card. the coloring is beautiful. Pretty purple mermaid! You are an inspiration to all of us! Thanks for an opportunity to win. Love the purples!!! She looks fantastic! Awesome creation!!! Anya came out fabulous!!! Is this the one you were saying you weren't sure about?? You have got to be kidding me. She's awesome! The purple hair came out great and I totally love all the colours in the paper! Really cute! Love the colors you used! Mermaid Anya seems to be basking in the joyful celebration for TGF! awesome card.. LOVE how you coloring her!! Oooooh love the purples! What a sweet card. She's adorable Ash-so pretty in purple! Mermaid was my 1st Anya that I ever owned so this one's close to my <3! So glad you could hop w/ us!